Welcome to the LCMS brand and logo center. Here you will find information about LCMS trademarks and logos, our brand manual and graphics standards, our styleguide and links to information about the LCMS. If you have any questions regarding our branding or use of our logos, please contact the LCMS Church Information Center by calling 888-THE-LCMS (843-5267) or emailing infocenter@lcms.org. 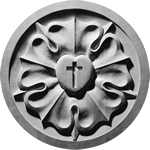 Upon approval, the LCMS cross logo may be used by LCMS member congregations and schools, Synod entities and auxiliaries and recognized service organizations. The logo is available in English and Spanish language variations. Upon approval, the Witness, Mercy, Life Together logo may be used by LCMS member congregations and schools, Synod entities and auxiliaries and recognized service organizations. Public domain: no permission needed for use. 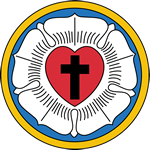 The tripartite logo-cross is the exclusive property of The Lutheran Church—Missouri Synod and may not be used without the Synod's express consent. The Synod's Board of Directors has granted a license to the following organizations to use the logo, in conformance with the Graphic Standards Manual: Member congregations and schools of the Synod. Synod agencies as defined in LCMS Bylaw 1.2.1(a). Agencies include boards, commissions, councils, seminaries, universities, colleges, districts, Concordia Plan Services, and synodwide corporate entities. Auxiliaries of the Synod (International Lutheran Laymen's League and Lutheran Women's Missionary League). Recognized Service Organizations may use the logo but only after first securing permission from the executive director of LCMS Communications. Concordia Publishing House has been given license to sell products featuring the logo or church signature. 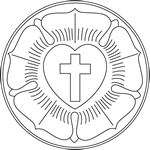 The license granted by The Lutheran Church—Missouri Synod to use the logo is nonexclusive and is revocable at the Synod's sole discretion. The logo may be used only in conformity with the Graphic Standards Manual. The logo may not be used by websites other than those of organizations mentioned above. Private businesses may not use the logo; nor may LCMS congregational members use the logo for business or personal use. Rare exceptions may be made only after consultation with, and securing permission from, the executive director of LCMS Communications, who will grant or not grant these exceptions on a case-by-case basis. If your LCMS congregation or school wishes to sell logo-related items (coffee mugs, T-shirts, etc.) at cost or for a fund-raiser, or if you wish to use such items to identify members (car decals, bumper stickers, lapel pins, etc. ), you may seek permission to do so from the executive director of LCMS Communications. In order to preserve the reputation, integrity, and unified message that the logo represents, you agree that you will use the logo only so long as your organization's services are provided (1) in accordance with reasonable standards furnished or approved by the LCMS from time to time, and (2) in compliance with all applicable laws and governmental regulations. Without limiting the generality of the above, if the LCMS requests, you agree to submit to the LCMS for review representative samples of advertisements, promotional literature and materials, artwork, press releases, public-relations material, brochures, Web pages, and other materials on which you use or intend to use the logo. 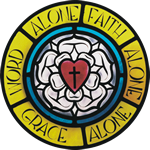 The “Witness, Mercy, Life Together” logo is the exclusive property of The Lutheran Church—Missouri Synod (trademark registration pending) and may not be used without the Synod's express consent. The Synod's Board of Directors has granted a license to the following organizations to use the logo: Member congregations and schools of the Synod. Synod agencies as defined in LCMS Bylaw 1.2.1(a). Agencies include boards, commissions, councils, seminaries, universities, colleges, districts, Concordia Plan Services, and synodwide corporate entities. The logo may not be used by websites other than those of organizations mentioned above. Private businesses may not use the logo; nor may LCMS congregational members use the logo for business or personal use. Rare exceptions may be made only after consultation with, and securing permission from, the executive director of LCMS Communications, who will grant or not grant these exceptions on a case-by-case basis.